How beautiful is the backdrop in these photos?! I love taking trips out to the Four Seasons at Aviara, located in Carlsbad, California. As I mentioned last week, I’ve been going out there every year since my early high school years – I kind of can’t believe how long it’s been! 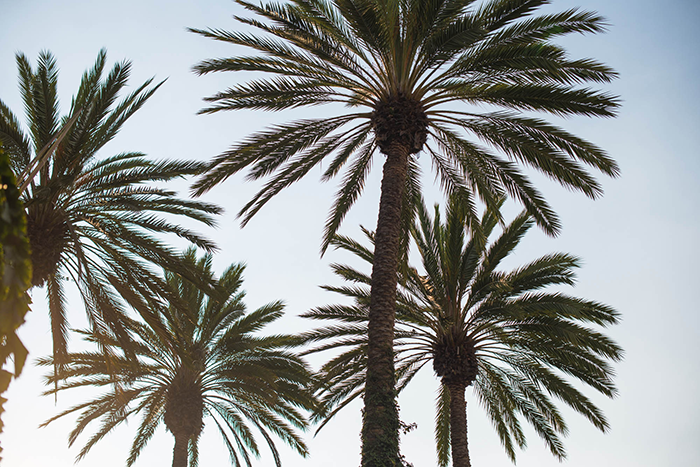 The weather couldn’t be better (sunny, mid-70’s) and with La Jolla, Del Mar and Rancho Santa Fe just mere minutes away, there’s so much to do (and eat!). While we visit a few favorite haunts every year (my favorite is The Market – incredible), this year we were determined to step outside of the box and try some new places. A couple of those included The Marine Room (fancy dining looking out on the beach) and Rancho Valencia (gorgeous grounds + the best service I’ve ever experienced). I wore this outfit to dinner at Jake’s in Del Mar, another spot we always hit while we’re in town. I found these shorts on major sale at Club Monaco before I left Dallas for Carlsbad, and knew they’d fit right into my vacation wardrobe. I wish more designers/brands would include giraffe prints into they’re collections – they’re so much fun and a little more unique + unexpected than a leopard print, don’t you think? However I might change my tune for this fab skirt and these slick jeans… I also love a good tiger print, which you don’t see very often either. 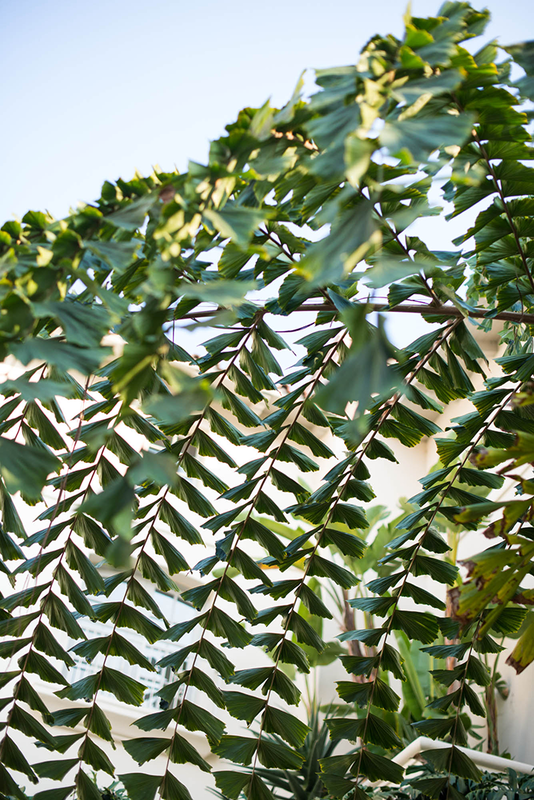 These shorts are pleated to perfection, allowing the silk to kind of billow, if you will. I just threw on my current favorite tank and it was an easy day-to-night look! Some other adorable prints I’m eyeing for fall include this malachite print dress, this zebra coat (under $150!!) and this super chic Tory Burch sheath. What are your favorite prints? LOVE this place! It’s such a great escape. You outfit is spot on. You look radiant, love these shorts. great shorts! I love them so much more than the brown giraffe prints. those shorts are fabulous! the entire ensemble is just my style & you look so pretty! I love those shorts! I have also been gravitating towards black and white this summer. I don’t know if its a mental preparation for fall but this look is so cute! And love the earrings for a little extra pizazz! I’m in love with this print! Awesome photos! Love the lighting! I am in love with those shorts! How dare they sale out ;). Love the styling! Such a cute pair of shorts and love the earrings too! Love this look (as always) but I really love your hair like that! Super cute! I am obsessed with your shoes. LOVE this! The print is perfect and the whole look is so clean and pretty. You look like you had an amazing time on vacation! You’re right, the backdrop on these pictures is beautiful. I really like those shorts! The print is very unique. Seriously in love with giraffe print right now! It’s such a great neutral with a little something extra! Great outfit! Such a gorgeous backdrop for your pictures! Love this outfit, too. The giraffe print is definitely more unexpected than a lot of other animal prints, and it looks so great on the shorts! Such a beautiful skirt! I love this simple and elegant look! You look gorgeous in this look darling! Nice look ! I love this bag ! Nice shorts, I like the print. And your top looks very comfortable. Those shorts are amazing! I always love black and white. You’re right, the backdrop is beautiful. I’m a sucker for a good giraffe print! So classic yet sleek and contemporary at the same time. 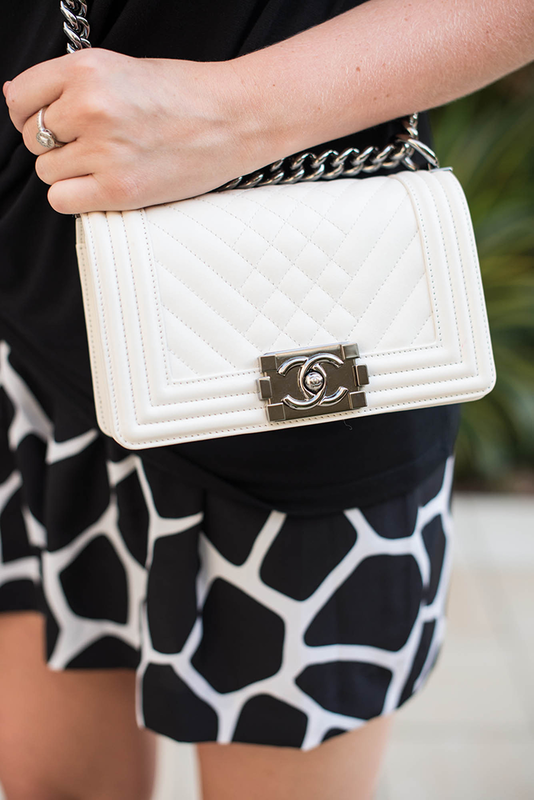 Love how you paired yours with that divine Chanel bag! Amazing outfit! You look fantastic! Love the giraffe printed skirt! I love EVERYTHING about this look! 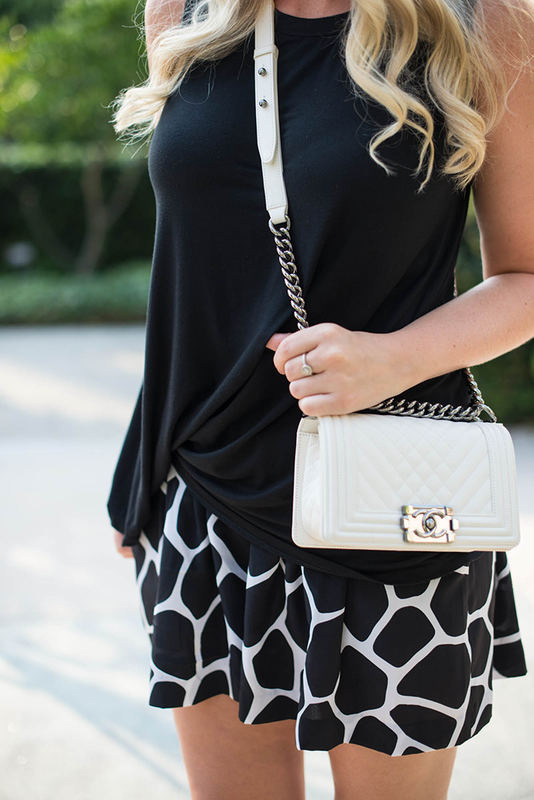 Black and white is always so chic and I love the drape of the tank with those printed shorts. And the bag of course – its perfection!! Lovvvvvve this look! So chic! and jealous of your fabulous trip! those sunnies! I recently tried on these new D&G ones and think they are going to have to be a bday present to myself! Thank you for your kind words, Merritt! We are thrilled you enjoyed your time here. Hope to see you again soon.